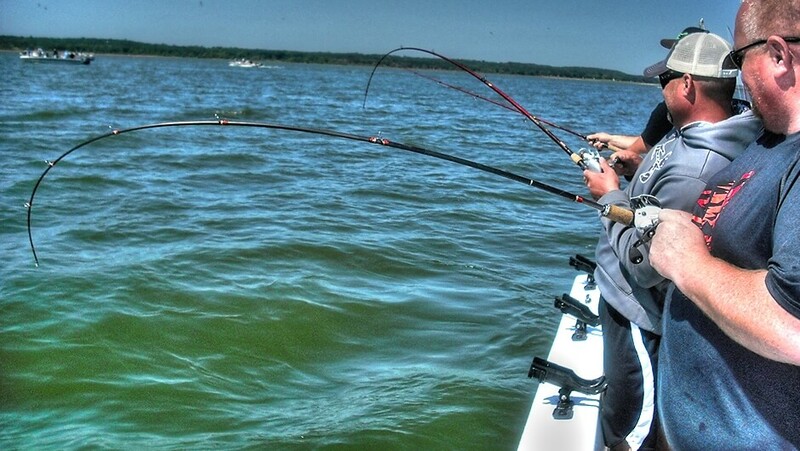 Enjoy a day on the water with Lake Texoma Fishing Guide Stephen Andre. Striper Fish Texoma with the highest Google Rated Artificial Lure Guide on Lake Texoma! Welcome to LAKE TEXOMA STRIPER HUNTER GUIDE SERVICE, run by myself - Captain Stephen Andre! We are the top rated Lake Texoma Fishing Guide Charter service and are fully Coast Guard Licensed and properly insured. I have been Striper Fishing Lake Texoma since 1996 and enjoy seeing my clients catch stripers! I specialize in artificial lures fishing for Stripers on Lake Texoma. When you call my guide service, you will talk with me and book your trip with me and I will be your guide. Some guide services use multiple guides so you have no idea what type of boat or what personality of guide you may end up fishing with! I am on the water daily so I will have an up to date Lake Texoma Fishing Report at the time you book your trip! I only use artificial lures, and fishing with artificial lures allows us to fish from very shallow water to very deep water and gives us the opportunity to move around and chase fish and see the lake and the natural surroundings. Chasing striper across Lake Texoma is very exciting. Locating top water schooling striper is a site to see. Striper hitting the surface and huge gizzard shad baits flying out of the water trying to escape the aggressively feeding striper. Cast out a swimbait or top water plug and HANG ON! These Lake Texoma Striper fight like there is no tomorrow all the way to the net. Drag screaming and rod bending action that you will not soon forget! Book a Texoma Fishing Trip! I provide a custom 26 foot Falcon center console, a very comfortable boat, with lots of room to stretch your legs. I personally rebuilt and redesigned this Falcon to be a fishing machine! Each person has their own comfortable chair and storage compartment. The boat is 26 feet long and has tons of room for 6 people and plenty of room left over for coolers and other personal items that you all might want to bring along. 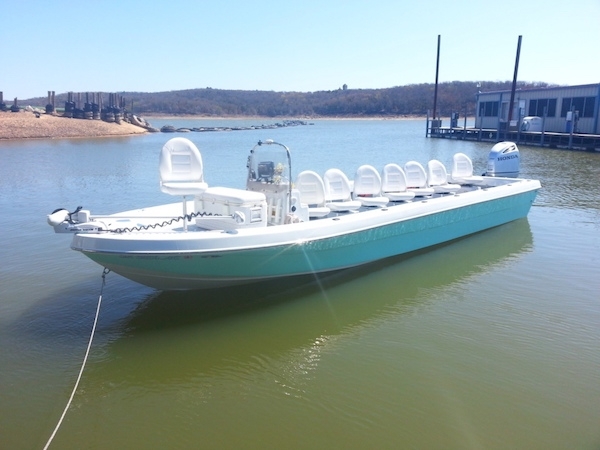 I spent almost 3 months completely redesigning this older boat just for guiding on Lake Texoma. Lake Texoma can have some huge waves when the breeze is up and this custom boat is safe and one of the smoothest boats you will ever ride in! 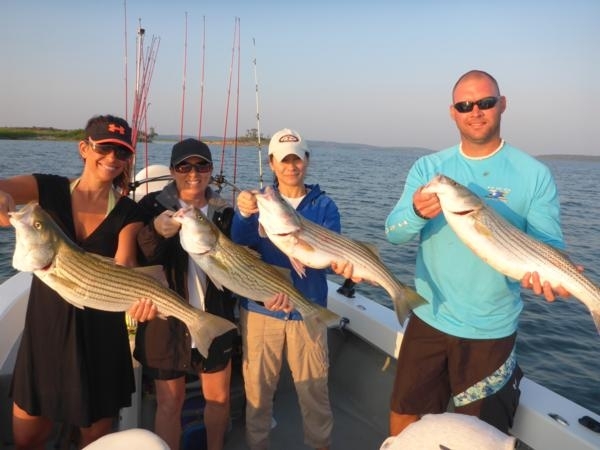 With all the latest electronics and fishing gear I have provided everything you need to have a successful Striper Fishing Trip on Lake Texoma. 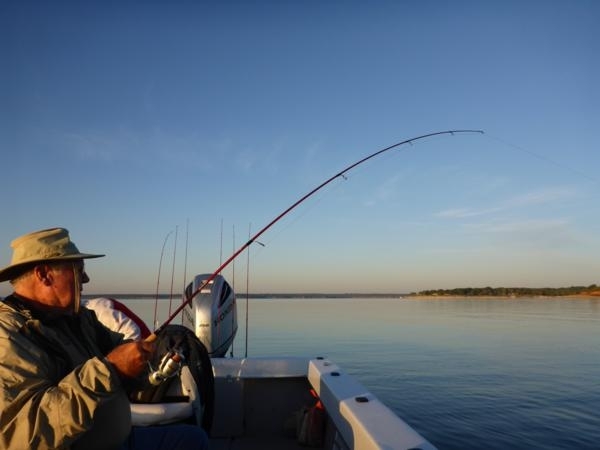 As an experienced Lake Texoma fishing guide, I provide the latest user-friendly gear and will teach everyone how to cast and fish with artificial lures... it is a blast and you never want to fish Lake Texoma Striper any other way! The art of casting and catching striper with artificial lures will get you hooked! I will clean and remove all red meat on your fresh fillets to take home and cook. I am a fully licensed and insured guide service that will provide guided trips that will be memorable. I can provide guide services for little as 1 person or large corporate groups as well. Kids are welcome as well! Once we board my boat and are on Lake Texoma, I watch for schooling Lake Texoma striped bass or target them at specific structure locations in the lake that I have learned about over the years. The Stripers will migrate from the Lake Texoma dam, all the way upstream and back throughout the year depending on the season. The fishing lures we will use vary depending upon the season: swimming style baits in winter and spring, topwater and swim baits in spring and summer, slabs and topwater baits in summer and topwater and swim baits in the fall. If the fish aren't biting in one location, we’ll move around the lake to find the location where they are biting. This will give you an opportunity to see beautiful Lake Texoma with its sandy beaches and large rock bluffs. You may see one of the many types of wildlife that live on Lake Texoma as well including deer, hogs, geese, ducks, ospreys and our American Bald Eagle in the fall and winter. Lake Texoma was impounded in 1944 as the Red River was dammed up for flood control. Lake Texoma is approximately 1.5 hours north of Dallas. It is a border lake on the Texas and Oklahoma border with about 80% of its 93,000 acres located in Oklahoma. Its maximum depth is 110 feet and has numerous islands, river ledges, and underwater structure that attract and hold numerous Striped Bass and Sand Bass. The lake record is 35.12 lbs! 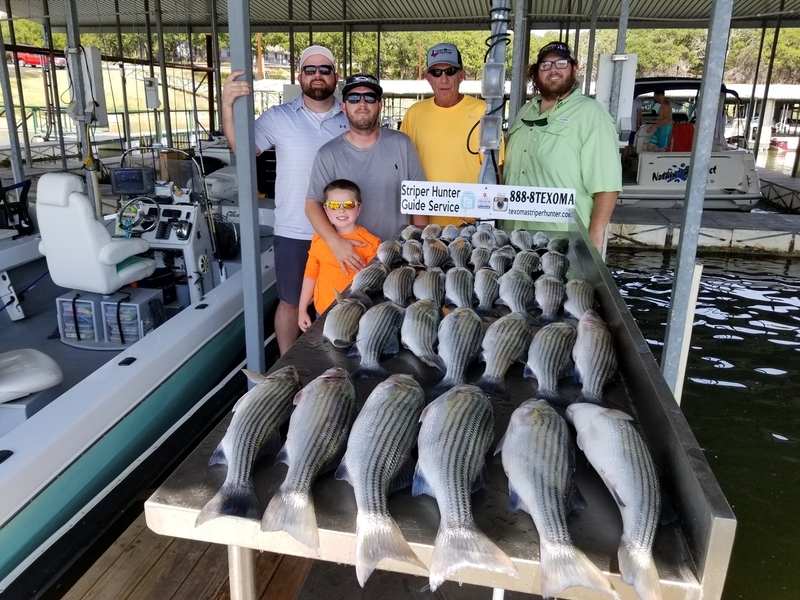 Striped Bass were stocked in Lake Texoma in the 1970's and the fish have thrived since then and naturally reproduce allowing a liberal 10 fish limit per person. The Striper limit per person on Lake Texoma is the largest in the country! Each year April thru May, these striper make a 50 to 80 mile journey up the Red River and Washita River to the spawning grounds. 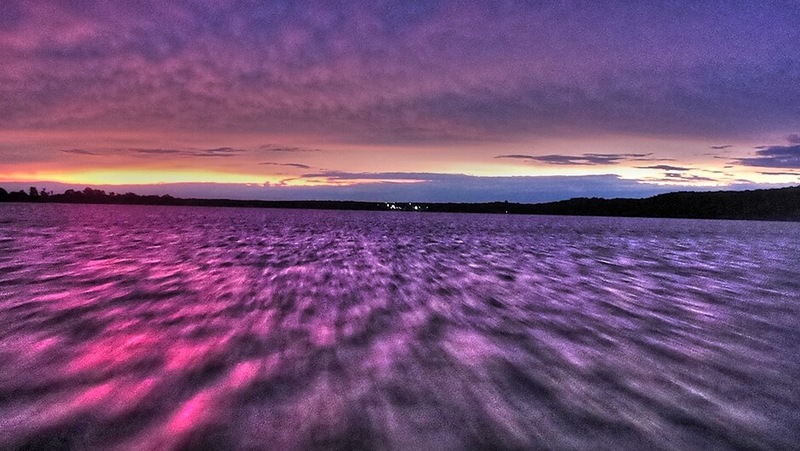 It is a magical movement of nature that results in millions of new striper in Lake Texoma each year. You will each be allowed to keep 10 striper. Out of those 10 you will be allowed to keep 2 striper over 20 inches. There is no minimum length limit on these fish. The reason there is a 2 fish limit on the "overs" or "long fish" is for protecting the mature striper so that they may spawn each year and keep the population sustainable. A 20 inch striper is typically 3 years old and is then old enough to spawn. With each female striped bass contributing 20,000 to 30,000 baby striper back into the lake each year, you can see why this lake is know as "The Striper Capitol of the World"! When you arrive at Mill Creek Resort and Marina in Pottsboro, Texas, I will be ready to go once you make your way down the dock and onto my boat. I'll go over some safety items and make sure everyone has their Lake Texoma Fishing License. Licenses can be purchased on smart phones at the last minute if necessary. We will leave the marina as the sky begins to lighten with the morning sunrise. We will head to my first honey hole of the day and watch the beautiful Lake Texoma sunrise over the horizon. The cool lake breeze blowing with the clean air is as good as a cup of coffee! As we settle into our first stop I will make sure everyone is comfortable with either a spinning reel or a bait casting reel. I will provide some casting instructions as needed to make sure everyone is confident and in on the action. That first cast with all the anticipation leading up to your trip that day is a special one! As we cast I'll give some instruction on how to reel or "work" the swimbait, spoon slab or top water plug as needed. That first morning bite and the "I got one!" is always an exciting moment! Fight that Lake Texoma Striper back to the boat and scoop it up with the net! Into the cooler it goes and we are catching and having a great time! When the striper bite dies off in that area we I'll fire up the motor and go looking. I will look for schooling stripers, or birds working the water, or submerged schools of striper using my side scan sonar. The remainder of the trip I will make sure we stay on the striper. If we are not catching, we will be looking for that next bite. Striper move fast and sometimes we will have to search to find them while you all are enjoying all the Lake Texoma scenery...such a beautiful lake. I do not use live bait. I am a true to heart artificial lure fisherman. I get much more satisfaction tricking those fish with an artificial lure. My guide service is unique in that I only use artificial lures. I do not use live bait and I do not troll. We will hunt our fish down using structure, birds and electronics. We FISH with slab spoons, swimbaits or top water lures. We FEEL that fish bite, SET the hook and FIGHT them into the net! That's the way I grew up and to me that's FISHING! Fishing with artificial lures allows us to fish from very shallow water to very deep water and gives us the opportunity to move around and chase fish and see the lake and the natural surroundings. I have clients that have only used live bait in the past with other Lake Texoma Fishing guides and they say they will never go on a live bait trip again. 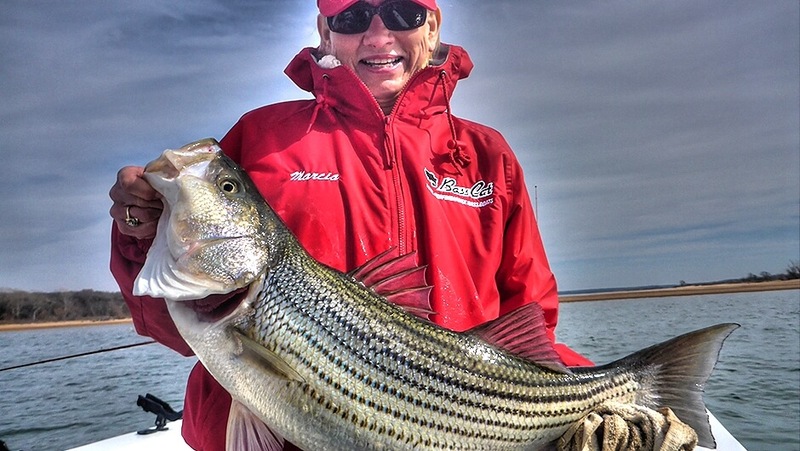 It is truly a special event when catching these striper on artificial lures. We're out there to catch fish and I will do what I need to do to make that happen. I will cover the entire lake if I have to in order to get some striper in the cooler for you all to take home. You are there to catch striper and I am there to make it happen! Located within the Mill Creek Resort and Marina of Grayson County, Pottsboro, Texas, our home base is within close driving distance of Cambridge, Pottsboro, Denison, Sherman, Durant & many other local communities. There are cabins to rent in the marina where I fish from as well as cabins and other hotels in the closet cities. I welcome you to join me on Lake Texoma for a great striper fishing trip. Follow our fishing trips on our Lake Texoma Fishing Reports section. Best Fishing in 86 Years of MY LIFE! "Capt. Stephen: I can't remember in all my 86 years having a better fishing day than you gave us. You were a great host, you have great equipment in your comfortable fantastic boat, and it was a great day of laughing and having "fish catching fun". You can bet, we will be back again." - Jim Bass Sr.
"Great Service! I have taken multiple guided tours at Texoma; Capt. Stephen is the best. Professional, patient and good teacher. I will be bringing my wife with me next time which says a lot. Nice equipment! Very relaxing and we caught a ton of fish. Thank you Captain Stephen for a great business trip fishing excursion. Well done!" "This was our second trip with Capt. Stephen. As expected, he was well prepared for the day and very attentive to everyone, but especially to the less experienced anglers in our group to make sure they were in good shape and promptly solving any issues. He was quick to remove fish that we caught so that we could get our line back the water quickly. On this day, the fish were a little difficult to locate. He didn’t give up until we found fish. Great experience once again, can’t wait to book another trip! Highly recommended!" Home Team Realty Texas, LLC. "We could not have asked for a more enjoyable experience. Capt. Stephen is proficient and prepared. He knows where the fish are! Made all of us feel confident and relaxed. He handled our varying levels of fishing experience with ease. Offered great instruction without out making anyone feel uncomfortable. Whether you are a novice or a pro, a trip out with Stephen will leave you with great memories and even greater anticipation. Anticipating next time!" 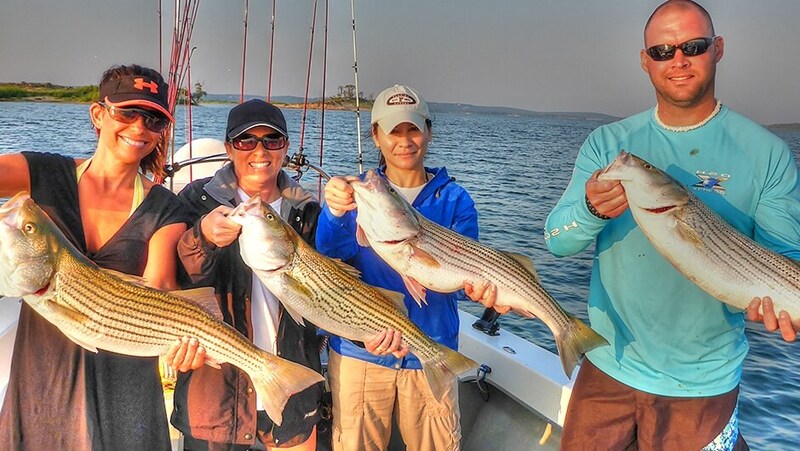 See all the Google reviews for Lake Texoma Striper Hunter Guide Service here!